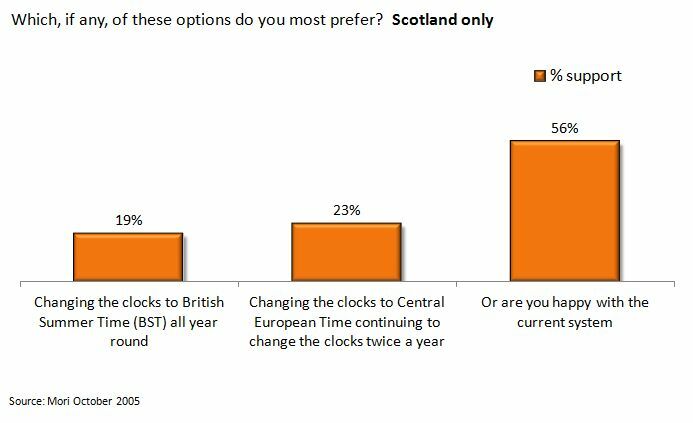 Will Scotland ever support an end to British Summer Time? 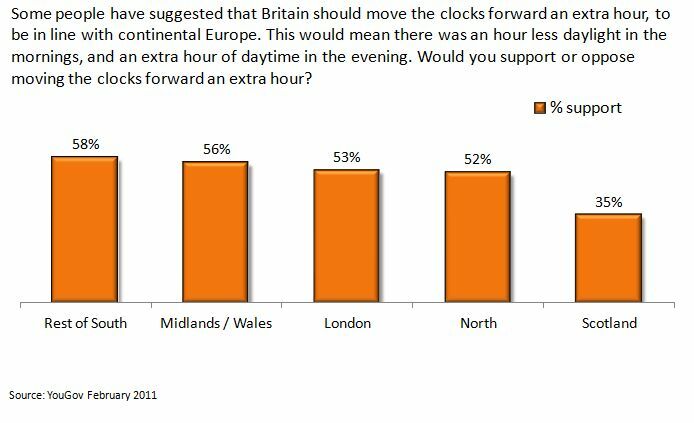 How other campaigners must envy those working on the campaign to shift forward UK time an hour, Lighter Later. A news hook big enough to hang the Glenfinnan Viaduct is gifted to them twice a year with such regularity you could, well, set your clock by it. Yet the story of public opinion about the proposal has become predictable. Most of Britain wants to abandon the current system, the government are open to it, but nothing will happen so long as the Scots have their say. The polls back this up to an extent, but the reality is a bit more interesting. On the question of whether we should make the change, YouGov’s poll from February this year shows about 50% more support than oppose it across Britain, though generally with more support the further south, and less the further north. But the question of why Scots oppose it so strongly isn’t all that simple. Curiously, this poll did exactly what I would do if I wanted to find the highest level of support possible for changing the system. The respondents were taken through the positive consequences of making the change, and then asked whether they would support it. You would expect support after those arguments to be higher than it would have been if people were asked without any prompting. Why might this be? Perhaps there are other arguments against the change that Mori didn’t capture, which would show a logical argument from the Scottish point of view. 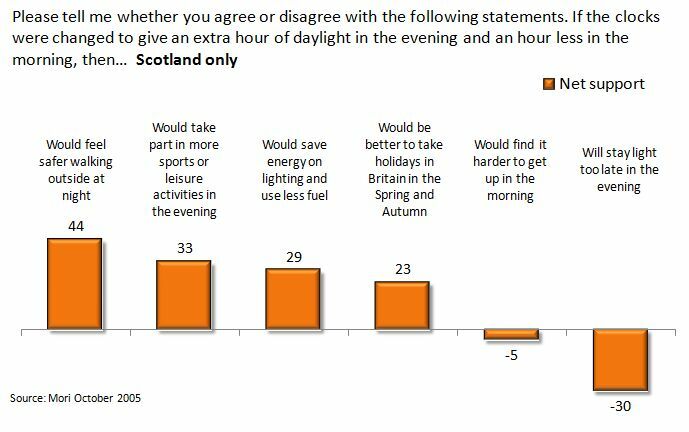 It’s a shame they didn’t test “it would stay dark too late in the morning”, which might have got more agreement. But I suspect there’s another, less tangible issue. For Scots, it may well have moved past the practical consequences of the change, and become a question of distant London interfering with life in Scotland, an emotive reverse West Lothian question. If that’s the case, the Lighter Later campaigners can forget about logical arguments about economic and environmental benefits ever winning Scotland to their cause. Their only hope may be for Westminster and Holyrood to agree to set their watches to different times. This entry was posted on Monday, November 7th, 2011 at 22:44	and is filed under Climate Sock, Social. You can follow any responses to this entry through the RSS 2.0 feed. Both comments and pings are currently closed.